Videoconferencing is about connecting people. It’s about improving the way we work, the way we communicate, and the way we manage our business relationships. Face-to-face meetings are vital to the success of these relationships. Maximize your level of collaboration in the fast-paced business world by utilizing video conferencing. Over 60% of face-to-face communication is non-verbal. 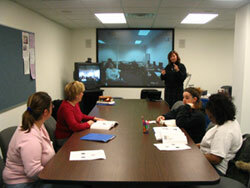 An enriched communications tool, such as videoconferencing, can enhance an individual’s or a team’s identity. Business professionals can waste valuable time using inefficient communication methods that can cost their companies money. Bring the latest technology with reliable and easy-to-use conferencing and collaboration to your next meeting.